Poland held its long course swimming nationals in Szczecin over the weekend to pick its squad for the world championships. A couple of familiar names won titles and earned their spot on the worlds roster, while a few new names will get their first chance to race in senior-level international waters. 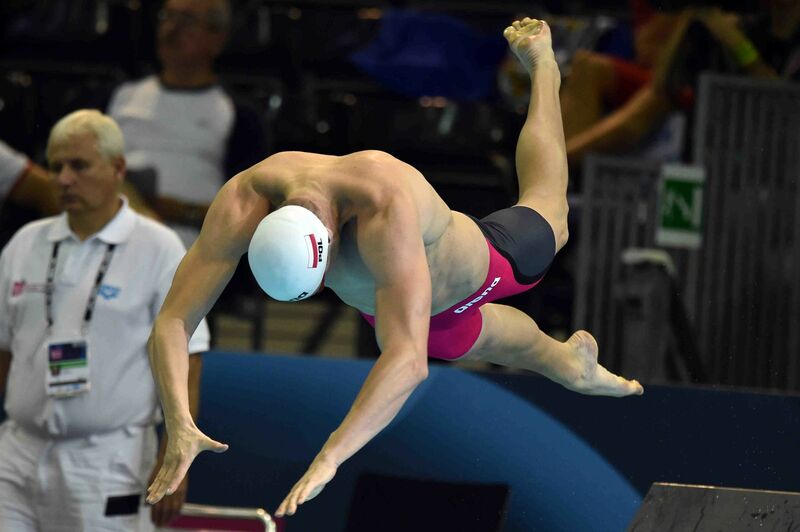 Konrad Czerniak is on a mission to upgrade his bronze medal from the 100 fly final at the 2013 world championships. Earlier this year, he posted the world’s fastest time with a 51.37, and the 25-year-old nearly eclipsed that with a 51.40 in Szczecin. That gives Czerniak the two fastest 100 butterfly performances in 2015 so far. It’s also not too far off his national record of 51.15. Pawel Korzeniowski is on pace to join Czerniak in the 100 fly world final to give Poland a major boost. Korzeniowski, who was an agonizing ninth at the 2013 worlds in the 100 fly, was second to Czerniak at nationals with a 51.71 for fourth in the world. Another swim at nationals sure to turn some heads worldwide was the 1:56.38 in the 200 backstroke by Radoslaw Kawecki. The 23-year-old was second in the event at the 2013 world championships and will be looking to stand at the top of the medal podium in Kazan this summer to complement his two short course world gold medals in the 200 back. Kawecki’s time currently ranks fifth in the world in a very tight group of swims in the 1:56 range. Kawecki’s European and Polish record of 1:54.24 from 2013 could be enough to win in Kazan. Kawecki also won the 100 back with a 54.09, just missing his national record of 53.82. Just behind him was Tomasz Polewka with a world championship qualifying time of 54.34. Korzeniowski is the 2005 world champion in the 200 fly, but surprisingly did not swim the event in Szczecin. He would have likely qualified for his sixth consecutive world championships in the 200 fly, but the 29-year-old is now focusing on sprinting, as evidenced by his two wins in the meet. In addition to the 100 fly, he qualified for worlds in the 100 free with a winning time of 49.04, and took the 50 fly with a 23.90. Though the 50 fly time was slower than FINA’s “A” cut, Korzeniowski will get to swim the shorter butterfly event since he automatically qualified in two other races. Placing second in the 100 free race and getting a spot on the worlds team was Kacpar Majchrzak with a 49.14. In Korzeniowski’s absence, Jan Switoski won the 200 fly with a 1:55.23, good enough for worlds qualification and a fourth-place world ranking to give Poland a very worthy replacement in the event. Placing second in the 200 fly was Marcin Cieslak with a 1:58.61, a few tenths off automatic qualifying. Switowkski also won the 200 free with a 1:47.85, and will be joined in the event at worlds by Majchrzak with his 1:48.13. Also in the race was University of Southern California sophomore Michael Domagala, who placed fifth overall with a 1:50.45 and just missed a place on a possible 800 free relay by three tenths of a second. Cieslak won’t get to swim the 200 fly at worlds, but the 2013 double NCAA champion will be in the 200 IM, thanks to his 1:59.30 to win the national title. It’s a Polish record, breaking his own mark of 1:59.77 from 2011. The time is just outside the top 15 in the world rankings. The other national record in the men’s side of the meet came in the 50 backstroke, where Polewka won with a 24.80, taking down Bart Kizierowski’s 2009 record of 25.27. Poland qualified at least one swimmer in every freestyle event for the world championships. Czerniak was the sole qualifier for the 50 free with a 22.17 to win another national title. He’s now in a four-way tie for 17th in the world, holding the spot with Federico Bocchia, Nathan Adrian and Ning Zetao. Poland’s distance freestyle got a boost from 19-year-old Wojciech Wojdak, who won the 800 and 1500 freestyles and earned second in the 400 free. He set a 19-and-under record in the 800 free with a 7:53.23 and won the mile with a 15:05.34. Notably, national record holder Mateusz Sawrymowicz failed to qualify for worlds with a runner-up time of 15:14.0, missing the cut by an agonizing eight hundredths of a second. Wojdak’s third event at worlds will be the 400 free, and he earned the spot with a 3:50.64 to finish second in a very close final. Wojdak and Michal Szuba were leading through 300 meters, then Filip Zaborowski made his move at that point to pull even with the pair for a race to the finish. Zaborowksi took the win with a 3:50.43, while Szuba’s third-place time of 3:50.87 tied the FINA “A” cut but was out of contention. Breaststroke is a weak spot in Polish swimming. No one is likely to swim in any breaststroke event at worlds, as national record holder Dawid Szulich failed to meet the automatic qualifying times in the 50 and 100 breaststrokes. Szulich won the 50 with a 27.86 and the 100 with a 1:01.96, well off the national records he swam at the 2013 worlds. Mikolaj Machnik won the 200 breast with a 2:12.56. In the 400 IM, Karol Zbutowicz won the event with a 4:21.51. Anna Dowgiert and Alicja Tchorz will represent Poland at the world championships, winning multiple events and each qualifying to swim two events in Kazan. Aleksandra Urbanczyk will join them after winning the 50 backstroke. Dowgiert’s top swim was a 26.13 in the 50 fly to break her own national record of 26.25 from a meet in Opole earlier this month. That record erased the 26.45 by Agata Korc that had stood since 2008. Dowgiert is just outside the world top 10, sitting in 12th with her record swim. She also won the 50 free with a 25.19, also under the FINA “A” qualifying time. Dowgiert might be able to swim the 100 fly as well in Russia, thanks to a 59.89 to win the 100 fly that was below FINA’s “B” standard. Urbanczyk took the 50 backstroke national title with a 28.38, just missing her own record of 28.21 from the 2013 nationals. Tchorz was second with a 28.48 to dip under the FINA “A” cut. Tchorz will also swim the 200 back in Kazan with a 2:10.55 winning time that beat the cut. She couldn’t get to the 100 back “A” standard of 1:01.25, but her 1:01.54 was fast enough to allow her to swim it in Russia as a bonus event. Tchorz also claimed the 200 IM with a 2:15.38. 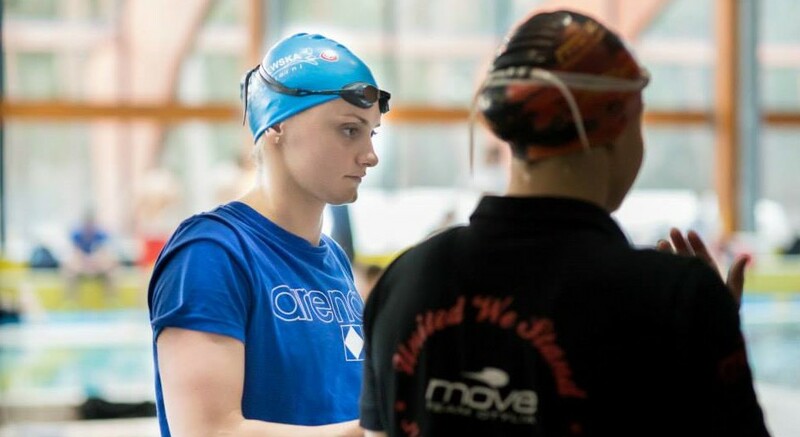 Justyna Burska experienced some heartbreak in two distance freestyle events, missing the automatic world championships qualifying time in the 200, 400 and 1500 freestyles by small margins. She won the 400 free with a 4:12.59, missing the qualifying time by .12 seconds. She took the 1500 free with a 16:35.83, falling short of the cut by two seconds. In addition, she won the 200 free with a 2:01.65 and the 800 with an 8:40.73 to take four freestyle titles in Szczecin. Katarzyna Wilk also missed out on making the world championship team by mere hundredths, winning the 100 free with a 55.20 to miss the automatic qualifying time of 55.05 and her national record of 54.95. Other winners include Klaudia Nazieblo, who took the 200 fly with a 2:14.57; Paula Zukowska, who won the 400 IM with a 4:49.83; Weronika Paluszek, who won the 200 breast with a 2:29.51; and Dominika Sztandera’s 32.07 and 1:09.62 to win the 50 and 100 breaststrokes.